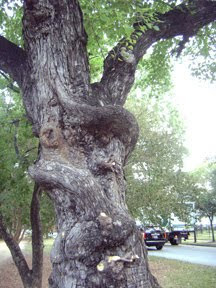 I took photos today of what I feel is the masculine face in Houston's Heights Boulevard Green Man tree. 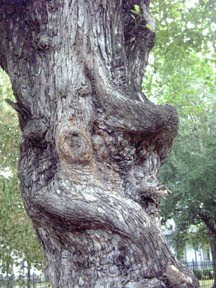 After walking around the tree to follow arms, legs, spines, and even proportions, the position of this second face does correlate to the intricacy of the tree's combined trunks growth. If you consider the protrusion of the broken limb to be the "nose", the "mouth" and "eyes" are findable. This is where you must decide, as we all do. Her face is visible in the photo below his. Your fancy lends credence or your logic infuses doubt. Whichever you believe to be true IS true for you. I have overlaid the photo with marks to show where my mind sees the face. Kinda. I think I've drawn it as a basic happy face. The image I see is sleeping and almost expressionless. But what I have marked is the closest thing to a face in the area where the face has to be for them to be so tightly spooned together within the trunk. See what you think. Having grown up climbing Chinese Tallow trees, I'd estimate this tree to be anywhere between twenty and fifty years old. The pairing of the two trees growing into one has made it difficult to tell by the girth of the main trunk. Here is the side photo that shows them spooning. What do you think? Do we have a mysterious couple living and loving within the body of this tree or is this just fall fantasy? You decide. I visited a while with the Green Man tree this morning and have two notes of update. First, the tree is not in the 900 block, but rather the 800 block, a bit north of center. There are two trees heralding it from the south: a glorious sycamore and a majestic oak. As you pass the oak walking north, you'll see the Chinese tallow with the Green Man on the right (east) as you come around a gentle curve. Second, I believe I may have found the other countenance. I didn't have my camera with me today, but I'll take it with me tomorrow. The photos I have do not show all of this second "face" but it is directly above the first. I must say that the first seems very feminine to me and the second is distinctly masculine. Early one morning last week I was walking Heights Boulevard and I looked up to see this tree. I have been walking this path for almost three years now and was quite startled to realize I had missed "seeing" this tree. I will say that I usually start at the north end of the boulevard and have just recently started my walks from the south end. Someone recently trimmed sucker branches off the trunk, which may be why I am able to "see" now, where before small branches and their leaves may have obscured the view. I recall seeing volunteers out last week digging, cleaning, and enhancing the Boulevard, as they sometimes do. I know that all those who walk, run, or even drive the Boulevard appreciate all those volunteers' efforts. This time their efforts have revealed a certain treasure. If you will look with a fanciful eye up and to the left in this photo, you can easily see a face in the bark "looking" back at you. In case you're not familiar with the legend or lore of the Green Man, he's kind of a Father Nature figure. He's a blend of everything we know about Pan, Odin, Santa Claus, Robin Hood, the Holly King, and many other legends that deal with the elemental energy of the forest and Winter. Since the beginning of time, man has realized that as Mother Nature completes the provision of her bountiful harvest, she must rest and recuperate. The leaves fall, the stubble in the fields is plowed under, the weather cools, and the growing season seems to cease. Mother Nature will return with the Spring Equinox. Earlier here in Houston, later further up north. Our ash trees bud out February 2nd, but plums and pears bloom in January. While Mother Nature rests, the Green Man rules. 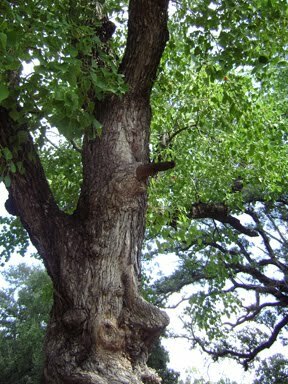 This tree is a Chinese tallow, commonly called a china-berry tree here. I know that the original Mr. Teas, of Teas Nursery fame, planted Chinese tallows all over the city because they turned such lovely colors. 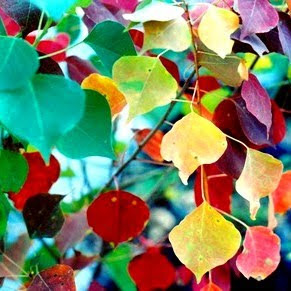 Most of our trees don't get a chance to turn the scarlets and golds of the maples and aspens of states further north. But these trees do change colors for us. A cold snap will pop their colors almost overnight. As you can see by these photos, there has been no cold snap in Houston yet, but I will say that I picked up two scarlet and gold china-berry tree leaves over a month ago when I first sensed the onset of Autumn. This tree "faces" south, so if you approach it from the north, the view is quite different. Just as striking, but completely different. The view from the south is the only one with the "face" so clearly defined. There are "arms" and "legs" in the curves of the trunk. It seems as if there is a couple spooned together, frozen forever in their vertical embrace. I have been walking around this tree for many days now, and have been so moved by the energy of the tree I think about it as I approach it, and say "farewell" to it as I pass it again, completing my walk. The tree has been on my mind so much lately it even inspired me to remember to bring my camera, take these photos, and write this blog. As you can see in this image, there are two "bodies" in this tree. Though I have looked carefully for the other face, I have yet to "see" it. This morning I walked around it slowly and thoughtfully, completely present in the moment. I touched the tree but have not yet "leaned into" its energy field. The tree's spirit seems to call out with its forever open "mouth" marked with its orangish lips. I don't get a sense of fear or dread or entrapment at all. More of a delicious sense of calm serenity that comes with being held in a lover's embrace. The upper "arm" seems to gently frame the "face" while the lower "arm" seems like a lover's arm holding their lover's arm to their body. Realize that all this anthropomorphizing is fanciful and romantic, but know too that we see our world as we believe it to be. 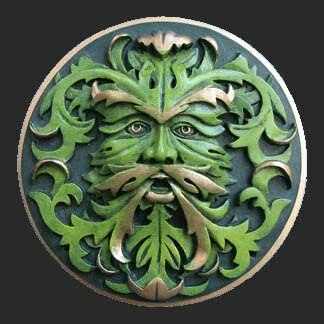 I encourage you to learn about the Green Man. You'll find him when you look for him. I've seen him in drips of paint on my window sill. 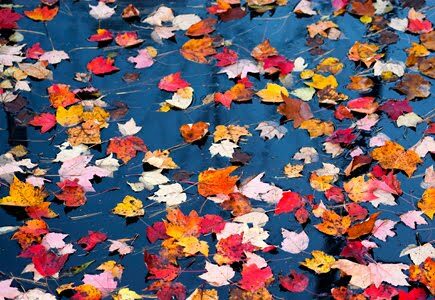 I've seen him in the patterns of the falling leaves. I've even seen him in the carvings of my sister's fireplace mantle. The Green Man's lore dates back as far back as time itself. Man is just as aware of the growing season as the winter. For every day there is a night, for every summer there is a winter, for every birth there is a death. The Wheel of Life includes a bit of every season and cycle in which we may delight daily. I encourage you to research and celebrate the Green Man. If you'd like to visit this one, you'll find him on Heights Boulevard, between 10th and 9th Streets. If you find the other face, I hope you'll let me know. Here is the first in a series of videos to help you promote your own reputation. Let your light shine out like never before and watch your career improve! Feng shui tips to promote and enhance the fire energy of your Fame and Reputation gua. Discover why the new "energy saving" light bulbs are not beneficial to your reputation, care and handling of fire, and landscape rules to ensure your vision is unobstructed. Articles this month include: Fabulous Fall - how to bring the luscious colors of fall into your life; Brooms: Not Just for Flying - using brooms to sweep in fresh seasonal energies; Feng Shui Needs to Be Refreshed Regularly - when to call in an expert and how to do some yourself; and ideas for beginning your holiday gift shopping. Simply click on the title of this article to read and enjoy!